The library is partnering with Melrose Organizes For Real Equality (MORE) for a community read! 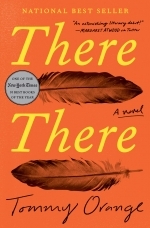 There There by Tommy Orange is a work of fiction but rings heartbreakingly true as it follows twelve characters through their lives in the Oakland, CA area. The author provides the reader with a clear window into the challenges of Native Americans in today’s society. Copies of the book are currently available at the Library. Speakers Heather Leavell and Faries Gray will begin the evening with a presentation and Q&A period. A resident of Melrose, Heather is a Native rights advocate and collaborator and a co-founder of Indigenous Peoples Day Melrose. Faries Gray is Sagamore of the Massachusett tribe and serves as adviser to Indigenous Peoples Day Melrose. A book discussion of There There will follow the speakers. Seating is limited; sign up online or call the library to reserve your seat (781-665-2313). Capacity: 28 of 35 spaces available.